Last week I got a pair of the Outdoor Research Ultra Trail Gaiters for trail running and I have since tested them to their limits! The testing for this gear review involved two 1+ hour training runs, both involving primarily trail running, but also some road. The trails in those two runs were a combination of soft, muddy trails with sporadic rocks, and some gravel path. The testing also included a 50km trail race on some of the gnarliest, most technical trails in North Vancouver. The OR Ultra Trail Gaiter is designed to be breathable and lightweight while providing protection from debris and mud. The black upper material is both stretchy and water resistant. These gaiters attach to the laces at the front of the shoe using two metal hooks, and attach at the back using velcro and an anti-slip silicone print (see picture below). An additional cord is provided to attach the gaiter around the instep of your shoe. 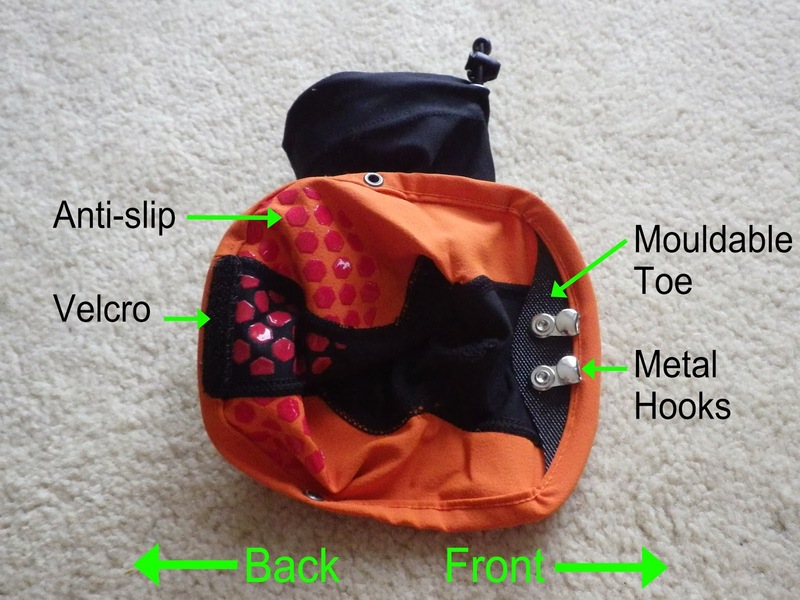 The top of the gaiter has a drawcord to allow easy tightening. And for the safety conscious, there is a reflective pattern on the upper for when, you know, you're running along a trail and you need to warn vehicles of your presence... OK, maybe not the most useful feature for a "trail gaiter", but could be worse. These Outdoor Research Ultra Trail Gaiters usually retail for about $50, so they're on the higher end for a pair of gaiters. Fortunately, we managed to get a good deal from an online retailer and ended up paying about $25. If you're just looking for a cheap pair of gaiters, then these are probably not the ones for you (perhaps try dirty girl gaiters instead), but if you're wanting something more skookum then try these out. Plus they come with OR's Infinite Guarantee. I'm lucky enough to be running in Altra's these days which come with preinstalled velcro on the back of the shoe, so I didn't have to do any prep to be able to use my Ultra Trail Gaiters. However, for most individuals they will have to apply one of the supplied velcro strips to each of their shoes before using their gaiters. This could be annoying is you run trails in multiple pairs of shoes or switch shoes often. Nonetheless, the velcro seems to really stay in place and keep the gaiter from moving. The metal hooks keep the toe of the gaiter in place really well, and don't seem to bother my foot at all! Plus, the mouldable toe piece helps keep the sides down against the shoe. As for the upper, you can't even tell they're there - they're really comfortable! Even after 5 hours of running they were fine! Most importantly, my ultra trail gaiters did their job perfectly, keeping out any and all debris and mud from my shoes! I concede that this is probably hard to accurately gauge as I don't always collect debris in my shoes, so not collecting any isn't as noticeable (you just don't think about things that aren't there!). That being said I think they really do work as I can't see why they wouldn't given their design. I could definitely get used to wearing these gaiters for all my trail runs; it's just nice not to half to worry about stopping to clear debris or any such nonsense on a long run! Instep cords frayed and broke, luckily they're not really needed! my books, but I did have one issue with them... I opted to use the instep cord to help prevent dirt/mud creeping up between the gaiters and my shoe, but by half way through the race I noticed that the cords were severely frayed. In fact, when I stopped to check them, the one had worn all the way through! Now I know that the race course was extremely rocky and technical, but if I'm able to wear through them in only about 4.5 hours of running (2 training runs plus half of the race), the cords were destined to fail eventually. On a positive note, even without the cord the gaiters stayed in place and kept me debris free, so they really won't be missed. On the positive side of things, these ultra trail gaiters are unbelievably comfortable! And they work to keep out debris as far as I can tell. Conversely, the fraying of the instep cord is a bit of a downer, and quite inconsistent with my experience with Outdoor Research gear. All said, I'd definitely recommend these gaiters to any trail runner due to the gaiter's comfort and ability keep out debris while on a long run. I just wouldn't expect the instep cord to be useful for very long (not that you need it).